Aberdeen Airport (ABZ) is located in Dyce approximately 7 miles North West of Aberdeen itself. The airport is generally open from 03.30am or 2 hours prior to the first flight departure of the day and closes after the last flight arrival of the day. Aberdeen International Airport only has one terminal with two floors and this accommodates all passenger arrivals and departures. The check-in area is located on the Ground floor to the left as you enter the airport terminal and the Departure Lounge is located on the upper level. You can check-in at the airport and you should do so by visiting the relevant check-in desk(s) that has been allocated to your flight and airline. If your airline offers Online check-in, then you can check-in for your flight Online prior to your flight departure. Several airlines now offer the ‘Self Service’ check-in facility at the airport and these are located next to the traditional check-in desks in Departures. As with any other International airport, passengers wishing to fly from Aberdeen Airport will be required to pass through airport security prior to entering the Departure lounge and boarding their flight. Aberdeen International Airport offers a number of choices for parking including, Long Stay, Short Stay, Priority and Offshore parking. You have a choice of undercover parking, wider parking bays, ‘keep your keys Parking’ is close to the airport and there are free complimentary transfers to and from the car parks to the airport. The airport does offer a FREE Drop Off facility and this is located in the Long Stay car park. However, you will only receive 15 minutes of free parking in the designated spaces. Aberdeen Airport offers an Express Drop Off zone which is located outside the airport terminal on the upper forecourt. However, there is a charge for using the Express Drop Off zone and it is £2 for 15 minutes (at the time of writing). If you exceed the allocated 15 minutes, you will be charged an additions fee upon exit. Blue Badge holders will receive 30 minutes FREE parking in the designated spaces which are located in the Short Stay car park at the airport. There are taxis available from outside the main airport terminal building. Taxis are a quick and convenient form of transfer from the airport and the journey from the airport to the centre of Aberdeen is approximately 15 – 20 minutes depending on traffic. Pre-Book a Taxi from Aberdeen Airport. There are a couple of bus companies First Aberdeen and Stagecoach Bluebird) that provide a public bus service from Aberdeen Airport to the city centre. The journey normally takes about 30 minute depending on traffic. No, there is no direct rail link to Aberdeen Airport. The nearest train station to Aberdeen Airport is Dyce and from Dyce train station, you can catch a train to the central train station in Aberdeen. 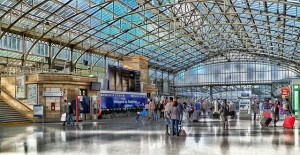 The central train station in Aberdeen has a wide range of train services to a large number towns and cities throughout Scotland and other parts of the UK. If you are travelling to and from the airport by car, you can access the airport via the A96 Inverness-Aberdeen road. There are several major car hire companies that are based at Aberdeen Airport and who have offices located onsite and just a short walk from the airport terminal. Avis – Hertz – National and Europcar all have offices at the airport and offer competitive car rental from the airport in Aberdeen. The closest petrol station to Aberdeen Airport is located on Argyll Road, and the postcode if you wish to enter it into your Sat Nav is: AB21 0AF. There are several restaurants and bars located throughout the airport serving a variety of food and drink for passengers arriving at and departing from Aberdeen. The airport lounge at Aberdeen International Airport is the Swissport Lounge and this can be accessed if you are travelling with an appropriate valid ticket or if you have purchased day entry pass. The lounge offer passengers complimentary snacks, drinks, newspapers, comfy chairs, television and WiFi. There is also a British Airways Terraces Lounge which is open to certain BA Club members and passengers travelling with designated tickets. The Eastern Airways Lounge is accessible for Eastern Airways passengers. If you are travelling to Aberdeen Airport and you or somebody in your party requires special assistance, you should contact the airport priore to your arrival. The airport has a very good support network in place for travellers who require special assistance and are happy to assist and help with your requests. If you need to leave luggage at the airport, you can do so by visiting the ‘Left Luggage’ desk which is located in the Check-In area. There is a charge for leaving luggage at the airport and it is generally charged per day. There is a designated smoking area ‘Airside’ which costs £1 to use. There are Several cash machines throughout the airport. There are a number of toilets located throughout the airport terminal. Trolley require a £1 or 1 euro coin to release the security and then the coins are refunded once the trolleys have been securely return using the security chain. There are a number of hotels close to Aberdeen Airport and passengers have a choice of star rated hotels to choose from. The Aberdeen Airport hotels cater for all budgets and are a popular choice with passengers arriving or departing on late night or early morning flights. The following hotels are located near Aberdeen Airport. Situated within walking distance from the main airport terminal. Located within walking distance from the main airport terminal but if you don’t want to walk, the hotel offers a free complimentary shuttle service to and from the airport. Located just 2 miles from the airport with a complimentary shuttle service provided to transfer you to and from the airport.